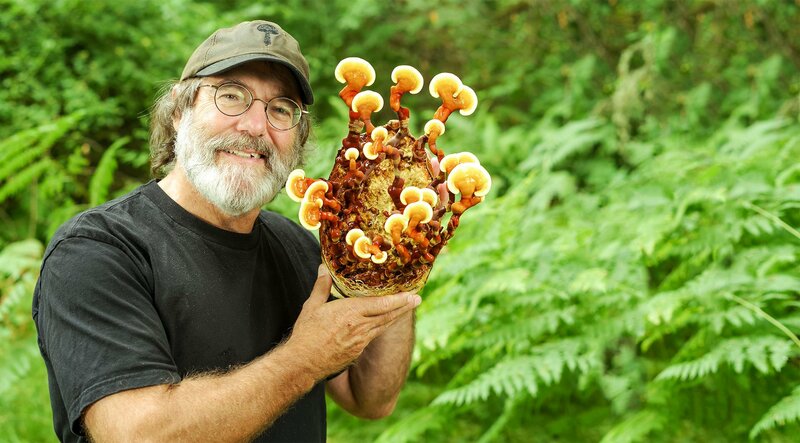 Fungi Perfecti founder and president Paul Stamets has been a dedicated mycologist for over 40 years. Mix & Match any of Paul Stamets’ books for a discount! Paul Stamets, speaker, author, mycologist, medical researcher and entrepreneur, is considered an intellectual and industry leader in fungi: habitat, medicinal use, and production. He lectures extensively to deepen the understanding and respect for the organisms that literally exist under every footstep taken on this path of life. His presentations cover a range of mushroom species and research showing how mushrooms can help the health of people and planet. His central premise is that habitats have immune systems, just like people, and mushrooms are cellular bridges between the two. Our close evolutionary relationship to fungi can be the basis for novel pairings in the microbiome that lead to greater sustainability and immune enhancement. Paul’s philosophy is that “MycoDiversity is BioSecurity.” He sees the ancient Old Growth forests of the Pacific Northwest as a resource of incalculable value, especially in terms of its fungal genome. A dedicated hiker and explorer, his passion is to preserve and protect as many ancestral strains of mushrooms as possible from these pristine woodlands. His research is considered breakthrough by thought leaders for creating a paradigm shift for helping ecosystems worldwide. Paul is the author of six books (including Mycelium Running: How Mushrooms Can Help Save The World, Growing Gourmet and Medicinal Mushrooms, and Psilocybin Mushrooms of the World), he has discovered and named numerous new species of psilocybin mushrooms, and is the founder and owner of Fungi Perfecti, LLC, makers of the Host Defense Mushrooms (www.hostdefense.com) supplement line. He has received numerous awards, including: Invention Ambassador (2014-2015) for the American Association for the Advancement of Science (AAAS), the National Mycologist Award (2014) from the North American Mycological Association (NAMA), and the Gordon & Tina Wasson Award (2015) from the Mycological Society of America (MSA). His work has entered into the mainstream of popular culture. In the new Star Trek: Discovery series on CBS, the Science Officer is portrayed by an Astromycologist.... a Lt. Paul Stamets. Paul's work with mycelium is a central theme of this series. Paul funds research to save rare strains of mushrooms that dwell within the old growth forests. He is a collaborator with numerous scientific organizations and research institutes. Currently he is testing extracts of these rare strains at the NIH (National Institutes of Health/Virology) and with Washington State University/United States Department of Agriculture against a wide panel of viruses pathogenic to humans, animals and bees.